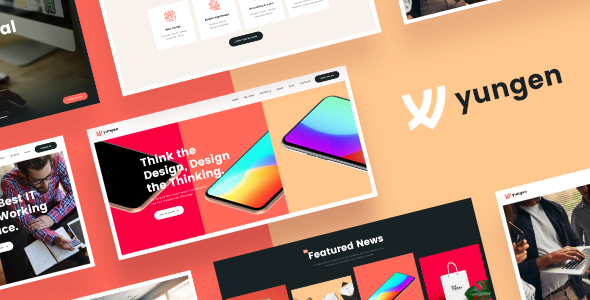 Stylish & Trendy WordPress theme Yungen was designed to help you launch a professional fresh & clean website and kickstart your private company or corporate business. No matter what field your startup is working in (web design studio, marketing agency, advertising bureau, architecture and interior design firm, etc), Yungen is just something you totally need to boost your profits. The theme is perfect for law firms, web, and creative agencies, marketing & advertising services, business consultant, website design, mobile development company, creative bureau, UX/UI Design. Also, the theme is great for those who deal with branding, style & identity, development, coding & technology, video production, photography, publishing services, printing, programming, App development, digital business, project management, as well as it’s good for a single businessman. Besides all that , Yungen fits financial firm, tax consulting bureau, accounting solutions, strategy planning, vibrant web and creative digital agency, economist analytics, startup company. Furthermore, it is great for a financial adviser, freelancer, lawyer, business coach, marketing and advertising services & analysis, financial and investment consulting, etc. It is also great for a financial blog and business news. Yungen is made with Elementor. Also, the powerful yet easy-to-use admin panel of the theme will help you customize every single post and page of it. The theme is supplied with the set of easy-to-manage page layouts that can be expanded and customized using shortcodes and custom widgets, as well as the mega-popular Elementor Page Builder. Stunning galleries integrated due to Essential Grid plugin allow you to showcase your services and portfolio.